While on a trapping expedition in the Makgadikgadi Pans during the 60's, Jack Bousfield stumbled upon a site that so captured his imagination that he set up camp under an acacia with the unshakeable expectation that others would feel the same. 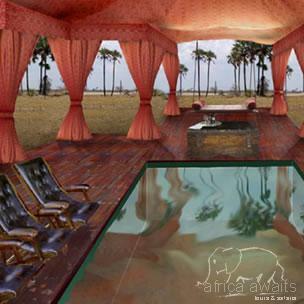 As a homage to the vision of his father, Ralph, his son, and his partner Catherine established Uncharted Africa Safari Co starting with Jack’s Camp which was refurbished at the beginning of 2003 - in a traditional East African 1940's safari style. 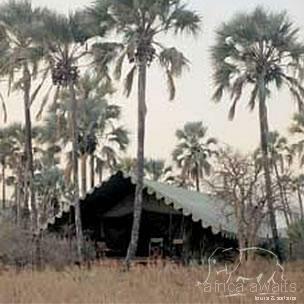 Ten green roomy and stylish canvas tents with en-suite bathrooms and indoor and outdoor showers (for those who want to feel the Kalahari breeze on their skin) have been fashioned in classical style and are set into a palm grove creating an oasis of civilization in what can be the harshest of stark environments. Persian rugs underfoot and cool cotton sheets form a striking contrast with the rugged wilderness viewed from the comfort of one’s own verandah. During the wet season the landscape transforms. Clouds of flamingo and other migratory birds descend from the heavens to decorate the watery grasslands. Herds of zebra and wildebeest materialise, drawn by the lush grass, and for several months, the desert is teeming with game and predators. The guides at Jack's Camp are an erudite breed. Often graduate students who combine research with guiding, they team up with a small group of Zu/’hoasi Bushmen to guide our Guests on a morning’s walks and game drives. 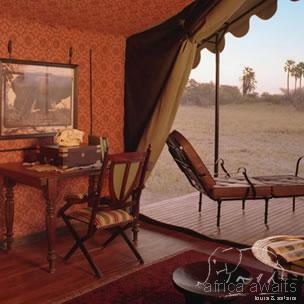 A safari to Jack's Camp is also a complete desert experience focusing on species unique to the area such as aardvark, gemsbuck and springbuck. It is the only place where guests are virtually guaranteed to see the rare and elusive brown hyaena and be able to walk through the Kalahari with a gang of habituated but, wild meerkats! With your holiday, safari or business trip from in to Jack's Camp in Botswana.